This harmonized, gridded global data set of soil parameter estimates includes files listing: (1) soil parameter estimates for the component soil units of each terrestrial grid cell, in un-binned format, and (2) soil parameter estimates aggregated or binned into a number of predefined classes. 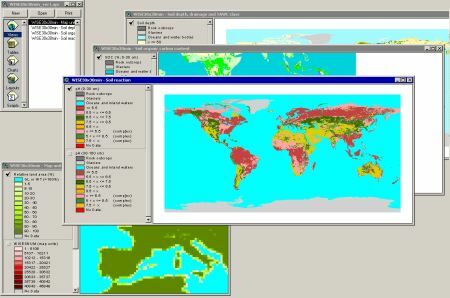 The spatial data, with a resolution of ½ by ½ degree, was derived from the ISRIC-WISE soil database. The land surface between longitudes -180o W and +180o E and latitudes +90o N and -90o S has been characterized using 45948 unique map units; each of these can comprise from one to ten soil units, characterized according to the original legend of the 1:5 million scale Soil Map of the World (FAO-Unesco 1974). Soil parameter estimates for each of these units were derived from analyses of some 9600 profiles held in a working copy of WISE (ver. 2.0). Twenty-two soil variables, identified as being useful for agro-ecological zoning, land evaluation, crop growth simulation, modelling of soil gaseous emissions and analyses of global environmental change, were considered. Parameter estimates for the topsoil (0-30 cm) and the subsoil (30-100 cm) are presented for the following variables: content of organic carbon, total nitrogen, the C/N ratio, pH(H2O), CECsoil, CECclay, base saturation, total exchangeable bases, aluminum saturation, exchangeable sodium percentage (ESP), electrical conductivity of saturated paste (ECe), calcium carbonate content, gypsum content, content of sand, silt and clay, content of fragments > 2 mm, bulk density, total porosity. For soil drainage class, effective soil depth, and available water capacity (-10 to -1500 kPa), however, parameter estimates are presented on a profile basis. The parameter estimates - median values - presented here should be seen as best estimates; possible types and sources of uncertainty are discussed in the report. The data are considered appropriate for exploratory studies at global scale (< 1:5 000 000). d9eca770-29a4-4d95-bf93-f32e1ab419c3 Access to the portal Read here the full details and access to the data.